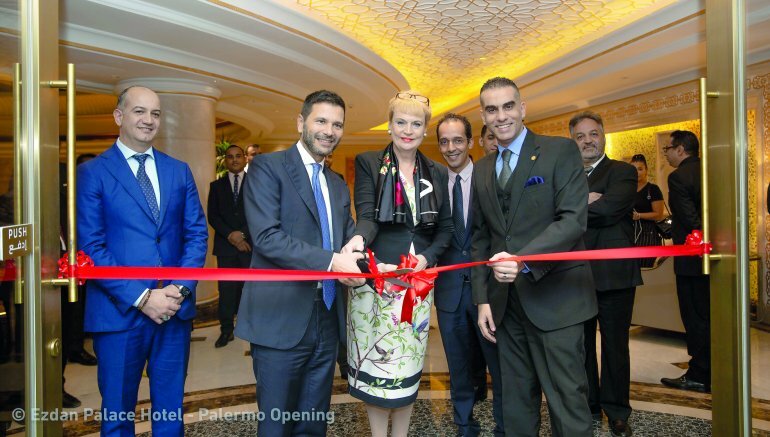 Ezdan Palace Hotel, the five-star indigenous hotel in Qatar, celebrated the opening of the new Palermo Restaurant. Located on the second floor of the hotel is the third International restaurant after TolaiTola and Red Orchid Thai Restaurant. The official ribbon cutting ceremony was graced by the presence of Ambassador of Italy, Pasquale Salzano, Ambassador of Sweden, Ewa Polano, and the Ezdan Hotels Group General Manager, Wael El Telbany and the celebrations were covered by media outlets. “We at Ezdan Palace Hotel are very excited to welcome Palermo. With the desire to offer our cherished guests an amazing dinning experience and ultimately creating lasting memories,” Ezdan Hotels Group management said. Palermo is poised to offer dinners comprising an exciting array of fresh, authentic home and handmade Italian cuisines served in a friendly and a relaxing atmosphere. Palermo seats can admit over 150 people and serves audience with open kitchen. It also includes two VIP dining rooms with a pool view and uniquely decorated family friendly dining area, as stated by Ezdan Hotels Group management. The family style menu offers a large selection of tasty delights for both seafood and meat lovers. Palermo is opened daily from 6 pm to 11 pm.